If all you care about is girls, you shouldn't read this. The reason we mix these two is that we want to show that Bavaria produces more than one kind of beauty. 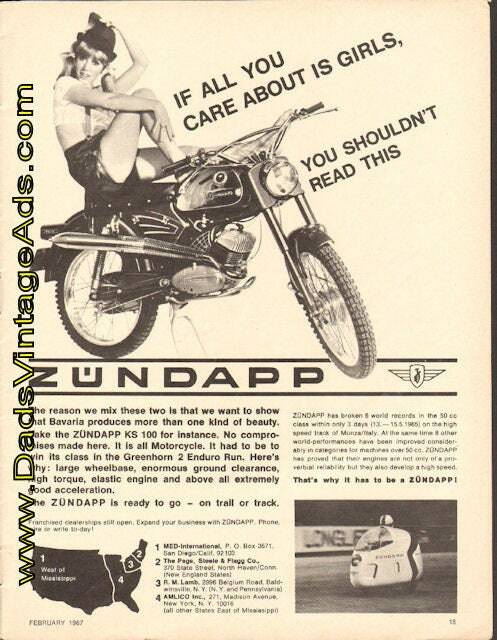 Take the Zundapp KS100 for instance. No compromises made here. It is all motorcycle. It had to be to win its class in the Greenhorn 2 Enduro Run. Here's why: large wheelbase, enormous ground clearance, high torque, elastic engine and above all extremely good acceleration. The Zundapp is ready to go - on trail or track.